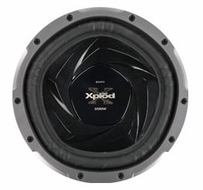 Add low-end bass to your in-car entertainment system without sacrificing valuable storage room. The XS-L10S Xpl?d Slim Series subwoofer has a 2-7/8" mounting depth which makes it easy fit in special application enclosures. In addition to the extremely durable polypropylene cone, this 10" sub presents a 4-ohm load and handles up to 1200 watts of peak power. Depth (Approx.) : 2 7/8"
Dimensions (Approx) Depth : 2 7/8"